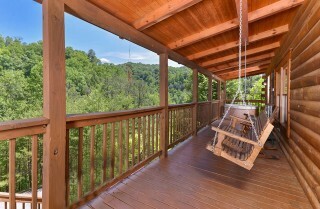 A semi-private escape in the Smoky Mountains surrounded by trees and packed with comfort. Now who doesn’t need that? We’re describing what you’ll find at Mountain Breeze —a 2-bedroom, 2-bath cabin just outside of downtown Pigeon Forge. 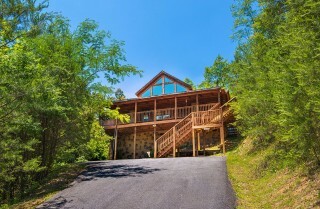 About 8 miles from city center, Mountain Breeze provides a quiet place to retreat in the Smoky Mountain woods. This 1,000-square-foot cabin is ideal for a couples’ getaway—perhaps with your parents, your in-laws, or your best friends. 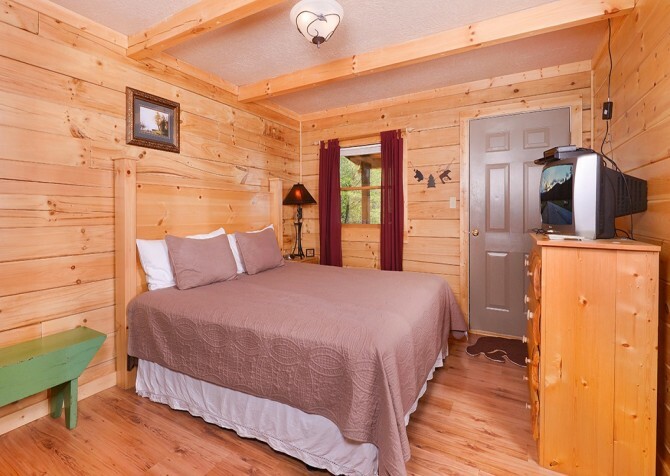 You can even bring the kids to this surprisingly spacious cabin. A double futon in the upstairs loft and a queen-size sleeper sofa in the living room provide comfortable accommodations for 4 more guests, so you can bring up to 8 on your Pigeon Forge getaway. Besides options for sleeping, Mountain Breeze boasts plenty of ways to relax and have fun, including an outdoor hot tub, 2 indoor jetted tubs, an electric fireplace, a pool table, and a rocking chair porch. With its A-frame architecture, large windows, and log interior, Mountain Breeze truly provides that cozy feeling of home with views you’ll find only in the Smokies. Reconnect with loved ones, get some much-needed rest, and take a break from work and chores in this lovely Smoky Mountain retreat. 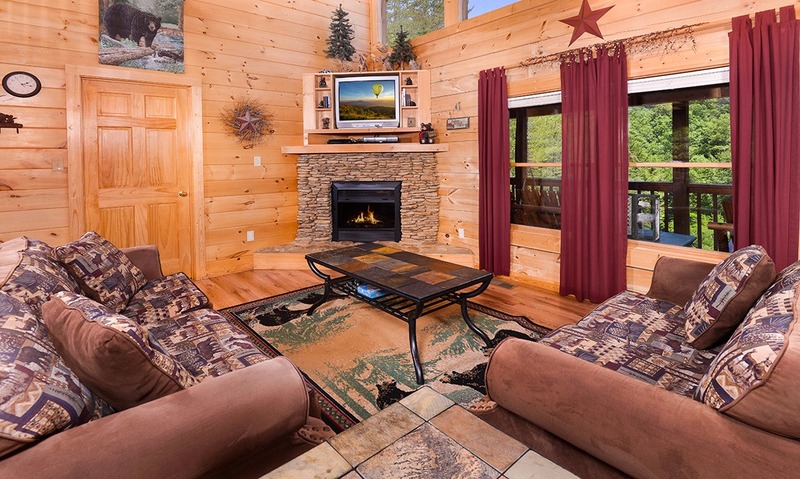 Flooded with natural light, the living room of Mountain Breeze is the perfect combination of Smoky Mountain décor and modern charm. 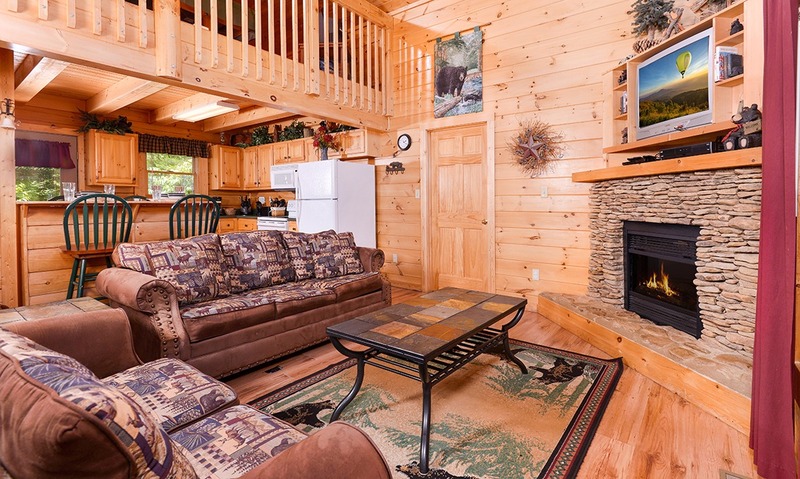 The symbol of the Smokies (the American black bear) can be found on everything from the area rug on the floor to the custom built-in above the stacked stone fireplace. 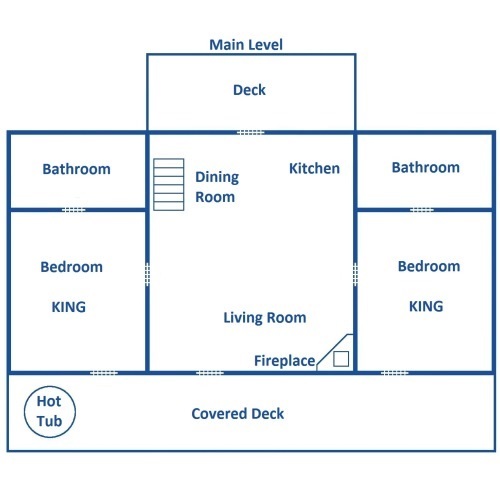 You’ll also find modern updates like hardwood floors, high ceilings, and an open-concept floorplan. 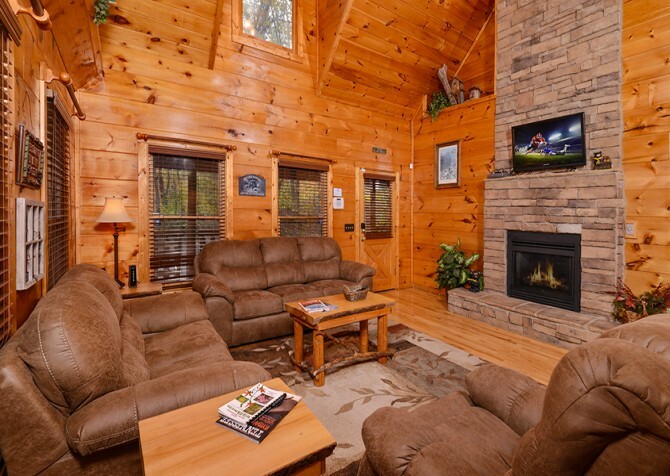 Two comfy couches—a full-size and a companion loveseat—provide your seating space in this room. After an afternoon of wine tasting in Pigeon Forge, you are invited to kick back with a glass of something refreshing and relax in your Pigeon Forge cabin. 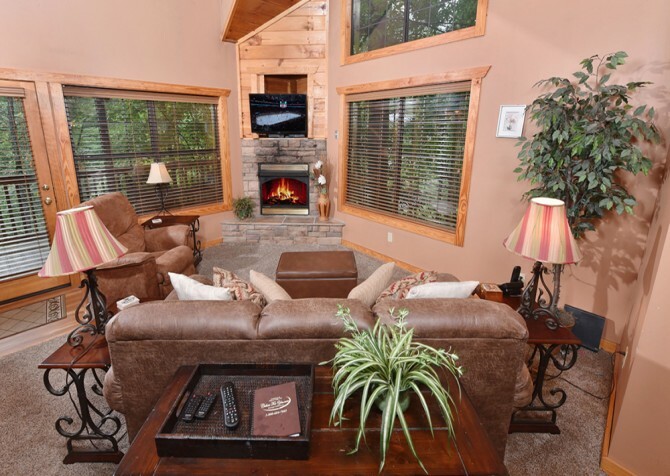 If you’re visiting in the late fall or winter, be sure to turn on your electric fireplace, and in the evening, enjoy movie night with friends and family using the TV and DVD player found in this space. Mountain Breeze makes mountain living easy and comfortable inside its large living room! 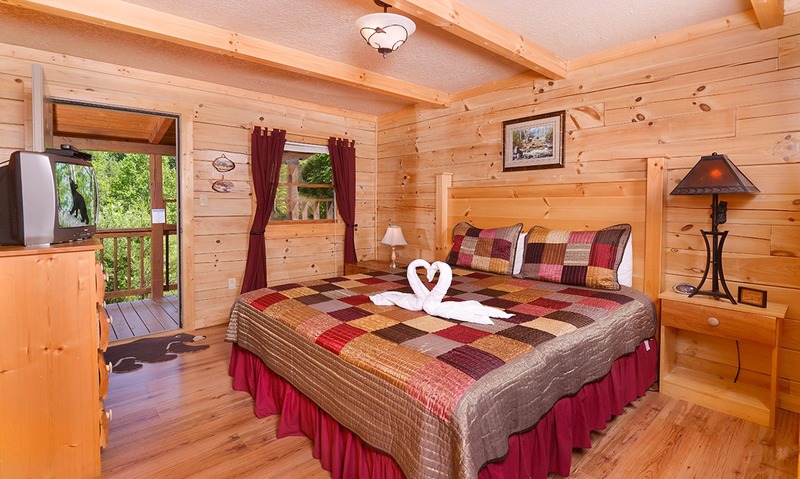 If you’ve taken the time to plan a couples’ getaway to Pigeon Forge, it’s probably because you wanted to spend the majority of your time together. Pigeon Forge Cabins makes that easy with its all-inclusive cabins, including Mountain Breeze. Along with 2 bedrooms and a large living area, Mountain Breeze offers a fully equipped kitchen. So you can plan for far better meals in the morning than a continental breakfast served at a hotel—and you can save money, gas, and driving time in the process. For those planning a springtime getaway, be sure to stop by the Gatlinburg Farmers Market and pick up some fresh wares for your homemade meals. You can easily prepare your fresh vegetables, fruits, and meats using the major appliances provided by Mountain Breeze. 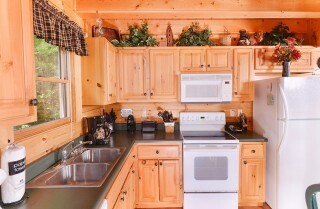 You’ll also have small appliances like a coffeemaker and electric can opener, along with dishes, glassware, and utensils. 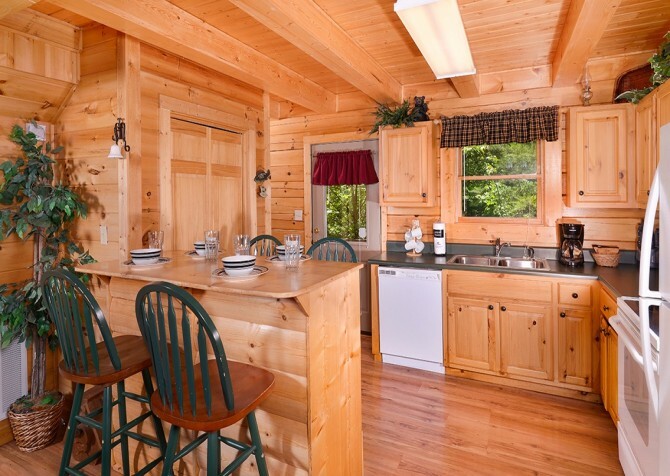 When you’re ready to serve and savor what you’ve prepared, head to the unique breakfast bar/dining area found inside this cabin. 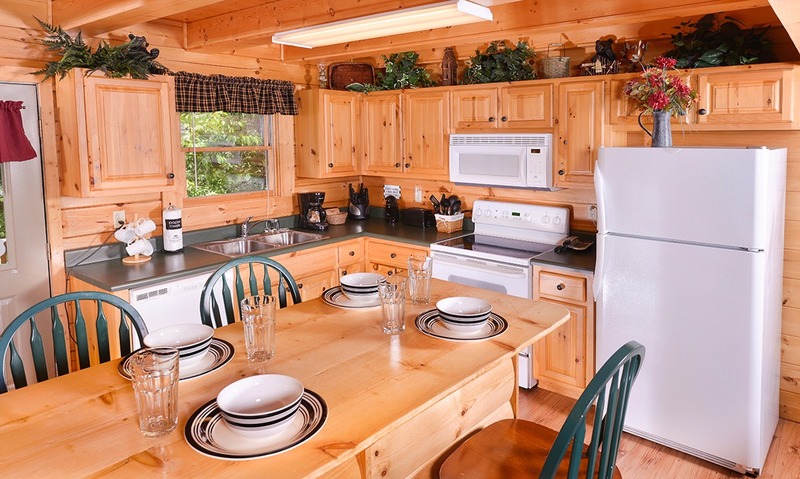 With space for 4, this dining area can function as a space for mealtime, game night, or coffee and dessert after watching a hilarious show at The Comedy Barn Theater in Pigeon Forge. 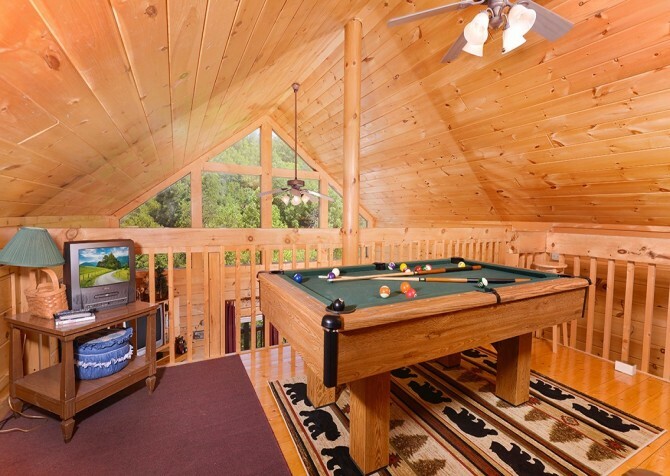 Although most of Mountain Breeze is contained on the main floor, there is a good-sized loft located up the stairs, which holds a double futon for extra sleeping space, a small TV, and a pool table. If you’re only traveling with 2 couples, use the loft as a hangout space for playing pool or a quiet nook for reading a book/taking an afternoon nap (because, let’s be honest, reading always leads to a little snoozing). 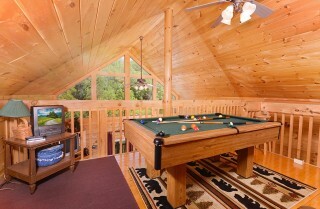 If you’re bringing kids for a family vacation to Pigeon Forge, then the loft is a perfect space to let them sleep. 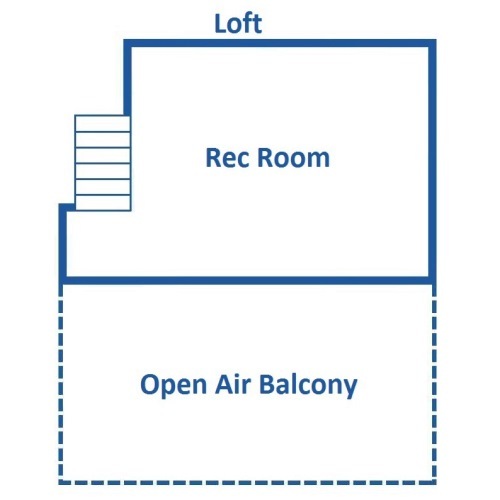 They’ll have their own space without being completely cut off from your supervision. 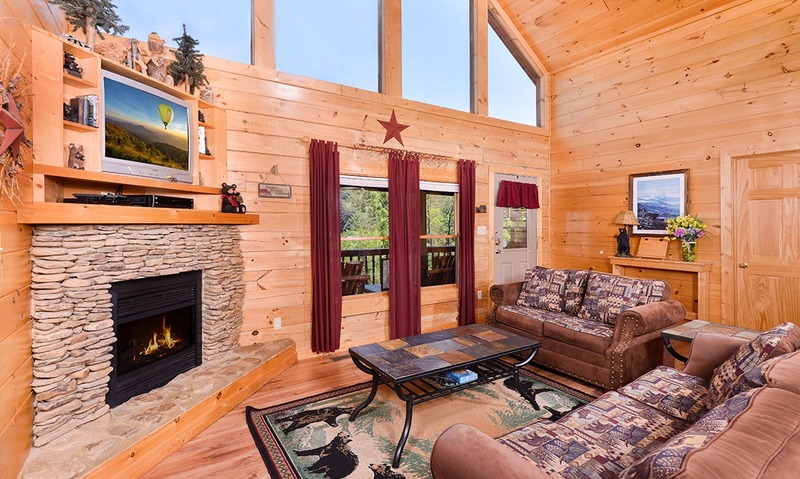 However you use it, Mountain Breeze’s loft is a well-designed space that turns this 1,000-square-foot cabin into a roomy retreat! The 2 bedrooms of Mountain Breeze are conveniently located on the main floor. 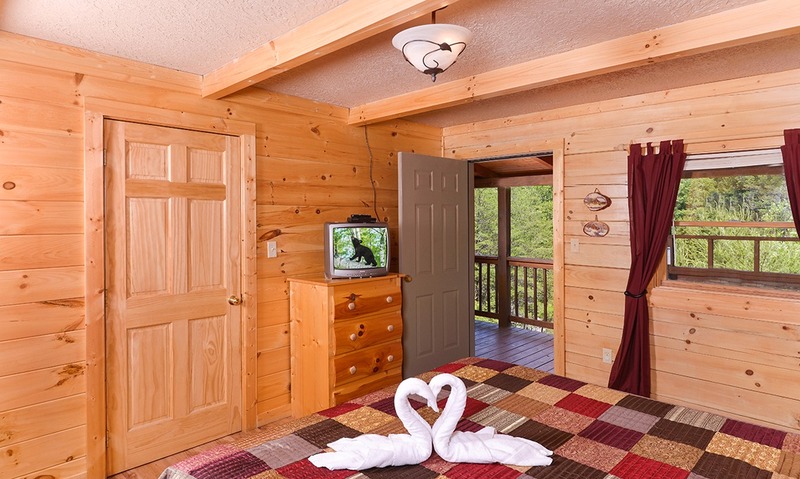 Each bedroom comes with a king-size bed, its own unique decor, wood furnishings, a small TV (equipped with a DVD player, though not with traditional TV programming), and—get this—its own private entrance to the back deck. 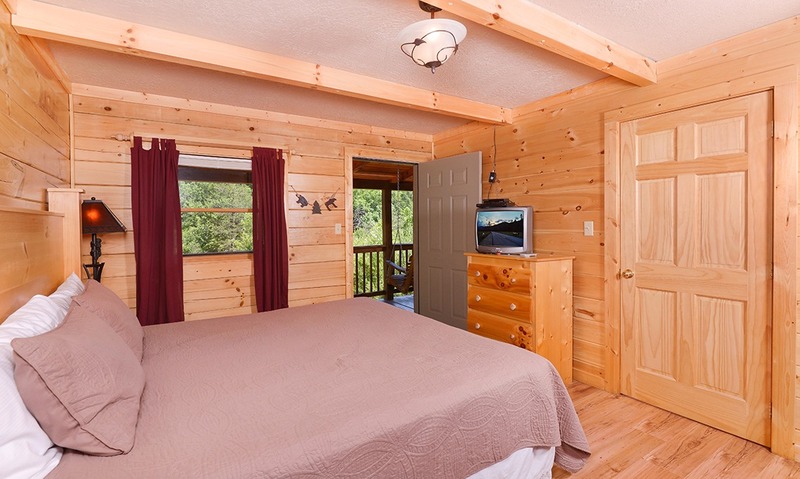 This layout is ideal for couples traveling to Pigeon Forge, because no one couple will end up with the better room. 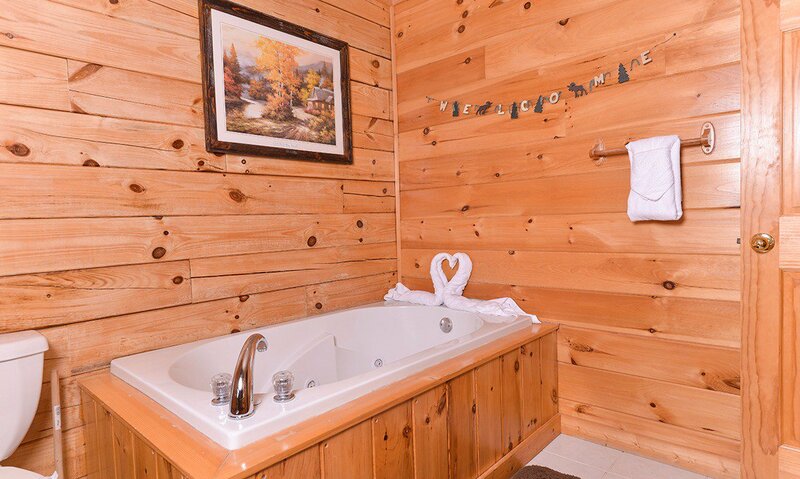 While not exactly the same, both rooms offer the same list of amenities, even when it comes to their private bathrooms—each bathroom features its own shower and indoor jetted tub. 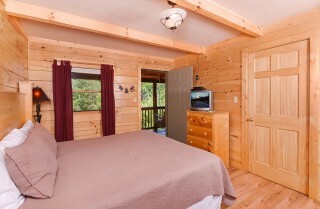 So keep things fair and your vacation faces on the whole week long at Mountain Breeze! 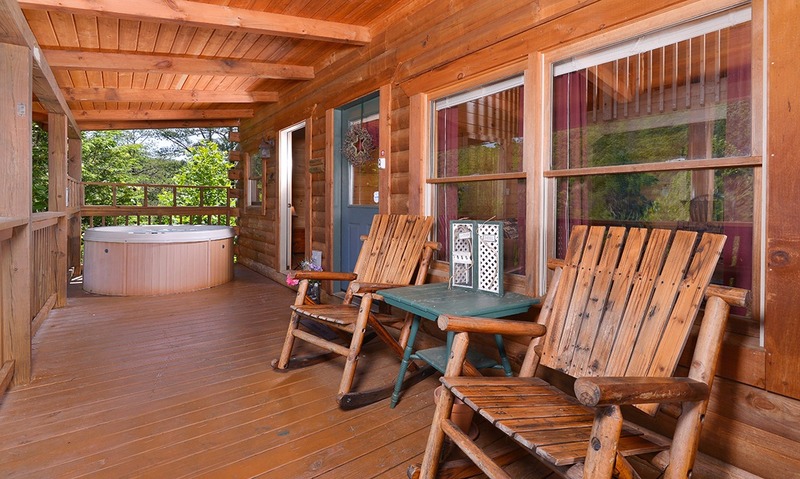 A lovely covered deck that overlooks the Smoky Mountain trees is what you can look forward to at Mountain Breeze. 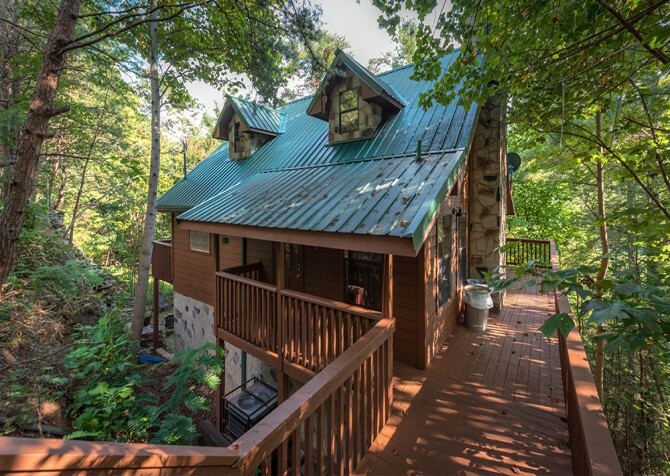 This semi-private cabin offers the quiet atmosphere of the Smoky Mountains woods, and you can watch those woods come to life with rich color during a fall foliage visit any time from mid-September through early November. Relax in the rocking chairs provided by Mountain Breeze or spend the evening swinging beneath the stars on your wooden porch swing. Round out your outdoor experience with a soothing dip in Mountain Breeze’s outdoor hot tub. 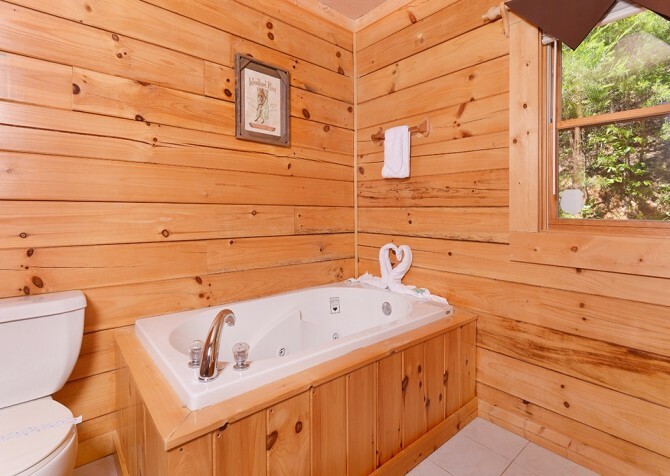 Nothing says vacation like being surrounded by lush, green trees and listening to those rolling bubbles! Remember that even though Mountain Breeze is a 2-bedroom, 1,000-square-foot cabin, you’ll find extra sleeping accommodations for up to 4 more guests. A queen sleeper sofa in the living room and a double futon in the loft turn this 2-bedroom cabin into an 8-person escape! 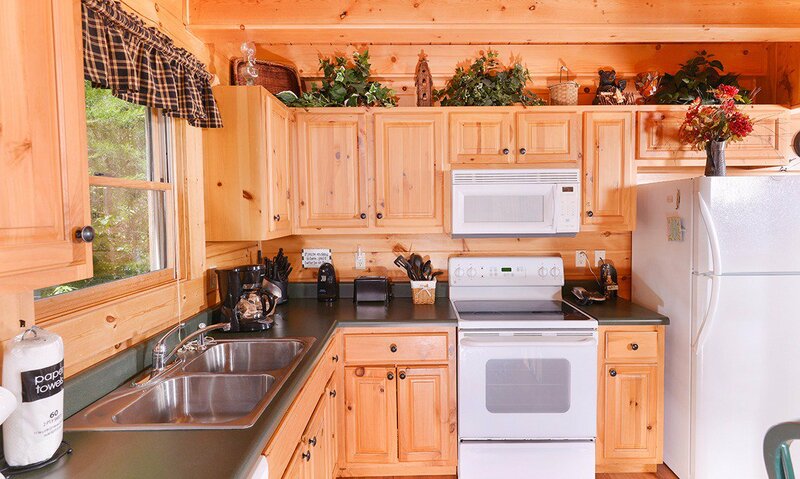 Other convenient amenities inside Mountain Breeze include a washer and dryer and even little things like a CD player for your favorite music and a hair dryer in the bathroom. The paved driveway (though steep) makes it easier to park on these mountain roads, and the gas grill on the deck gives the barbecue masters of your group an opportunity to flaunt their grilling skills. The advantage to Mountain Breeze is your ability to enjoy the Smoky Mountains without staying in the middle of downtown. 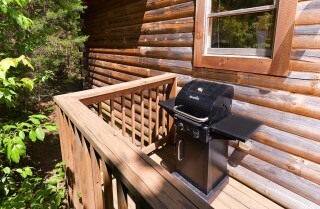 (This cabin is about 8 miles away.) But that doesn’t mean you should stay away from Pigeon Forge altogether. 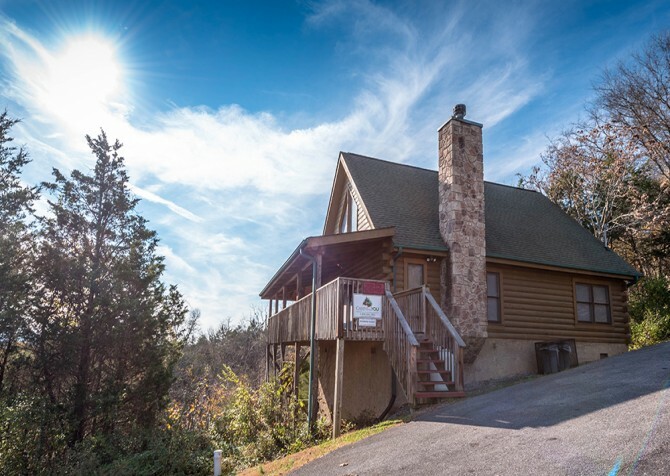 Operated by Dolly Parton’s famous Pigeon Forge theme park, Dollywood, this museum tells the story of Southern gospel music from its church roots to its mainstream popularity today. 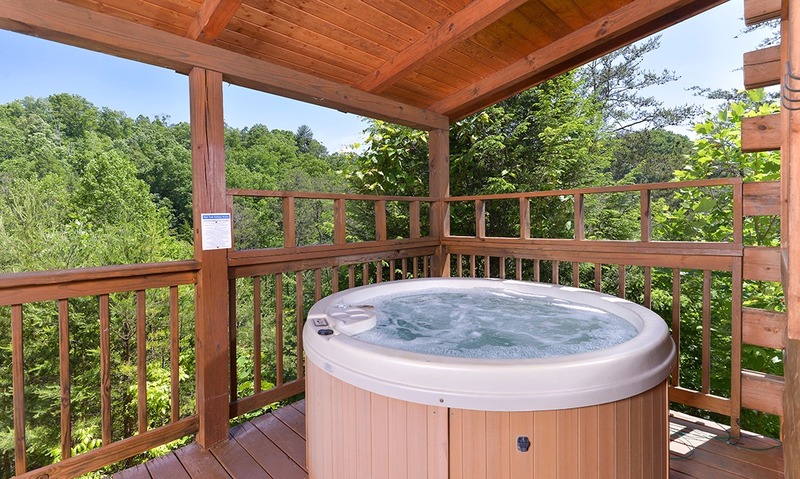 While the trees at Mountain Breeze provide the privacy you’re looking for, an attraction like the Great Smoky Mountain Wheel at The Island provides those stellar mountain views! 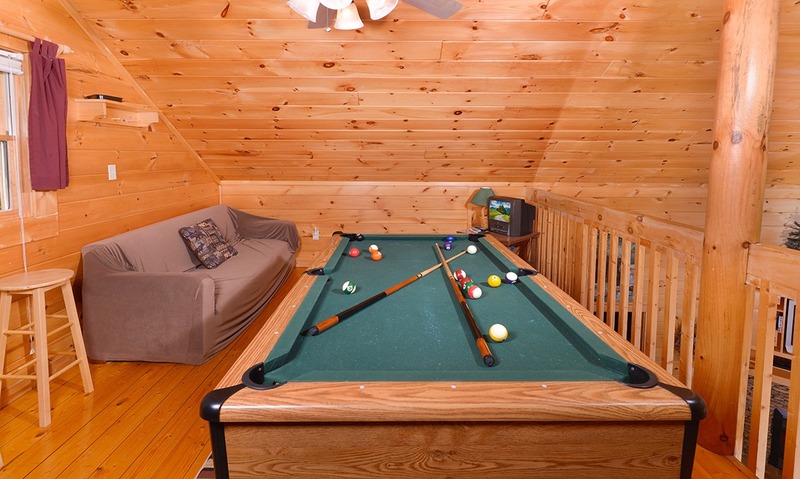 Located in the heart of Walden’s Landing, Firehouse Golf features 36 holes and 6 waterfalls in its firehouse-themed mini golf course. 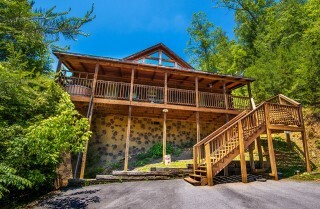 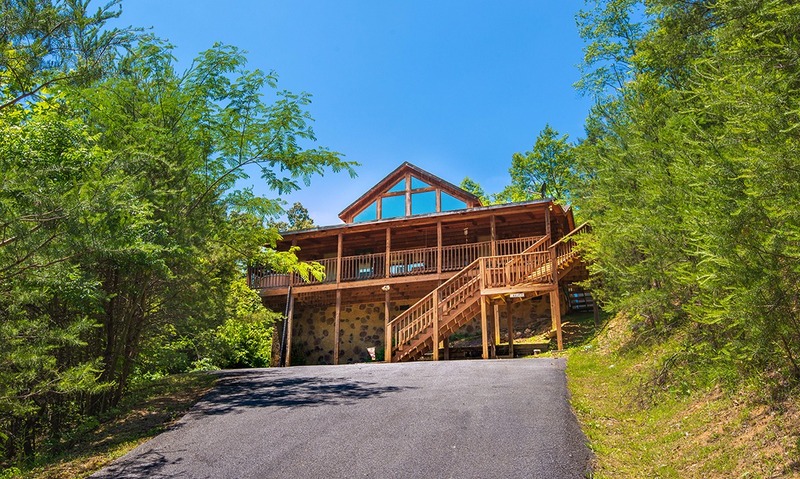 "Mountain Breeze is a beautiful cabin located very close to both Gatlinburg and Pigeon Forge! 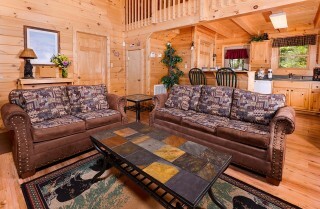 Although it was slightly smaller than expected, it was a great place for our large party to enjoy on vacation. We especially loved the pool table and hot tub. I would recommend this cabin to friends and family!"